Fire isn’t the only kind of combustion reaction. Some kinds of metal, if you leave them in contact with oxygen, will also react with the oxygen, but much more slowly, and without making a flame. Because this reaction is slower and doesn’t make a flame, we call that an oxidation reaction and not a combustion reaction. We call the result rust. Just like when you burn wood, the combustion reaction between iron and oxygen that produces rust, or iron oxide (a molecule containing both iron and oxygen atoms), also produces heat. In fact, rusting metal produces the same amount of heat as the fire, but spread out over a longer time, so the iron oxide or rust also cools off at the same time that it is heating up. Why does water make iron rusty? 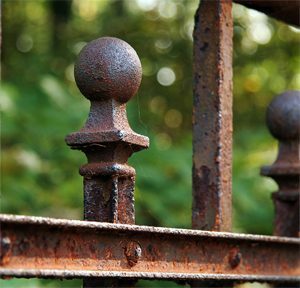 When iron is exposed to oxygen in the air, the two elements combine very slowly to make iron oxide, or rust. But if the iron and oxygen molecules are also touching water molecules, the water molecules speed up this reaction and make the iron rust a lot faster. One special kind of rust reaction happens inside a pottery kiln when you heat up a clay pot and there is some iron in the clay. The iron in the clay reacts with the oxygen inside the kiln and turns red. 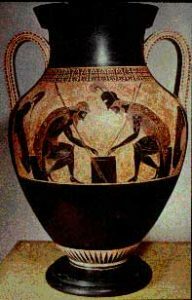 This is how Greek vase-painting worked. Cite this page: Carr, K.E. What is rust? Oxidation reactions and chemistry. Quatr.us Study Guides, June 3, 2017. Web. April 22, 2019.